France’s Cote D’Azur has inspired many of the greatest artists with its abundant natural beauty. One such artist is Pablo Picasso who spent a great deal of his later life there, including St Tropez where he rented a flat on Rue des Bouchonniers. Perhaps it was the inspiration behind his painting Girl Before a Mirror, whose typical cubist-style depiction of both a woman’s side profile and frontal image evokes the duplicity of St Tropez’s personality: the glamour and glitz vs. the quaint Provençal buildings; the hundreds of thousands of daily summer visitors vs. the elderly locals playing pétanque in the Place des Lices during the off season. There is yet another side to St Tropez, a lesser known and little explored side. 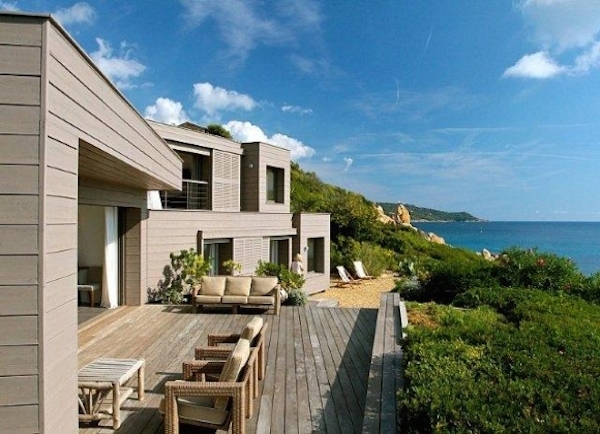 The wild and secluded Plage de l’Escalet is one of St Tropez’s best-kept secrets. A far cry from the famous Pampelonne beaches, the Plage de l’Escalet is off the beaten track but holds great beauty and charm. This is the land of Picasso: the ochre rocks, the coves of golden sand, the green and untamed forests and the dotted white sails across the azure blue horizon. In the midst of it all is Villa Cap Sauvage, a stunning beachfront villa to rent near St Tropez with 6 bedrooms. So rare is it to find a corner of the French Mediterranean coastline not bustling with the noise and heat of hundreds of tourists or indeed locals. Rent villas in Escalet beach however, and you can hope to enjoy a property that risks no compromise. No more than 12km from the centre of St Tropez, you can be enjoying the beautiful port, kicking back with a cocktail at a beach bar or tucking into a delicious seafood meal in no time and yet still enjoy the peace and tranquillity of the glorious Escalet beach in close proximity. The ultimate way to enjoy such a luxury is upon the spacious private terrace of Villa Cap Sauvage, an ideal place to sample the beautiful food and wine of the region in the cool sea breeze of the Mediterranean. Surrounded by the rugged wilderness of the Riviera, take in the famous sounds and smells of Provence, lounge under the balmy southern sun and enjoy late evenings with family and friends before retreating to the comfort of a warm log fire and cosy living room for digestifs. The sea views aren’t reserved exclusively to the communal terrace however. The en-suite master bedroom and queen size bedroom both have large private balconies whose French windows slide across to slowly reveal glorious panoramas of the stunning Cap Taillat. Get closer to nature in the generous swimming pool below. Within the settings of Villa Cap Sauvage’s charming contemporary wooden build, the pool is just a small thicket’s distance from the sea, creating the ultimate infinity pool sensation. Get even closer still by taking advantage of the villa’s direct access to the beautiful and peaceful Escalet beaches, an almost unique luxury rarely found elsewhere along the French Riviera.